The champion in 1996. Photo by Jean-Loup Gautreau/Getty Images. 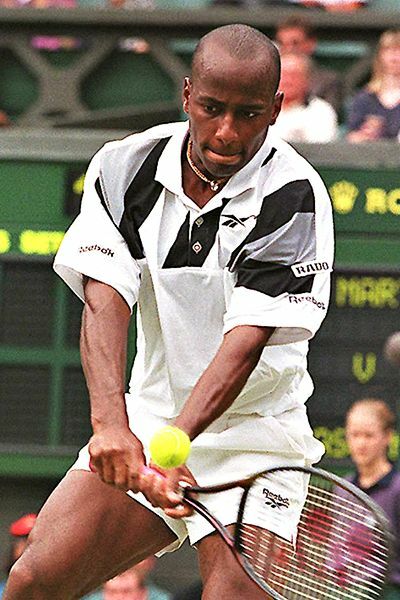 Twenty years ago, he was the NCAA singles champion, ranked 11th in the world, and on July 4, 1996, he made it to the finals of Wimbledon – the first African-American man since Arthur Ashe to reach a Grand Slam singles final. MaliVai Washington’s game was versatile and impeccable, he was virtually unflappable on the court, and over the course of his career, he won four Association of Tennis Professionalssingles titles and earned more than $3.2 million in prize money. Mal Washington & Trenden Davis, George Soper Student Athlete, 2010. But somewhere along the way, tennis became the vehicle — not the driving force – for Mal Washington to achieve the things that really mattered to him in life. 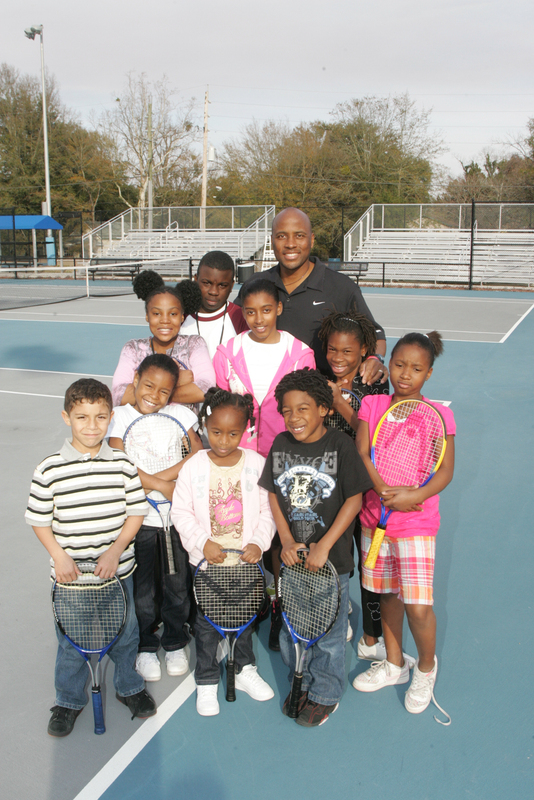 He began to work with the ATP in Ponte Vedra to introduce urban youth from nearby rough-and-tumble Jacksonville neighborhoods to the decidedly un-hip game of tennis. And it was there he met George M. Soper, my friend Susie Soper’s dad, whose birthday is today. The two unlikely friends (one white, 70 and Republican; the other young, black and a gifted pro) shared a similar vision: that tennis could provide the means to engage, inspire and improve the lives of Jacksonville kids living in a world of dropouts, teen pregnancy, gangs, drug abuse, and hopelessness. They often talked about leadership and character, and how to instill those ineffable qualities in young people. They liked each other. 100 volunteers tutor at the MWKF every year! In 1997, a year after Soper passed away, Mal Washington began a partnership with the Boys & Girls Club, teaching 25 inner-city kids to play tennis. Fourteen years later, the Mal Washington Kids Foundation has reached over 20,000 children with its wide range of programs, teaching kids how to succeed in the far more challenging game of life. Combining sports, academics, life skills, leadership, and service, the program offers a blueprint for a better future to Jacksonville kids whose families earn an average of $22,000 a year. 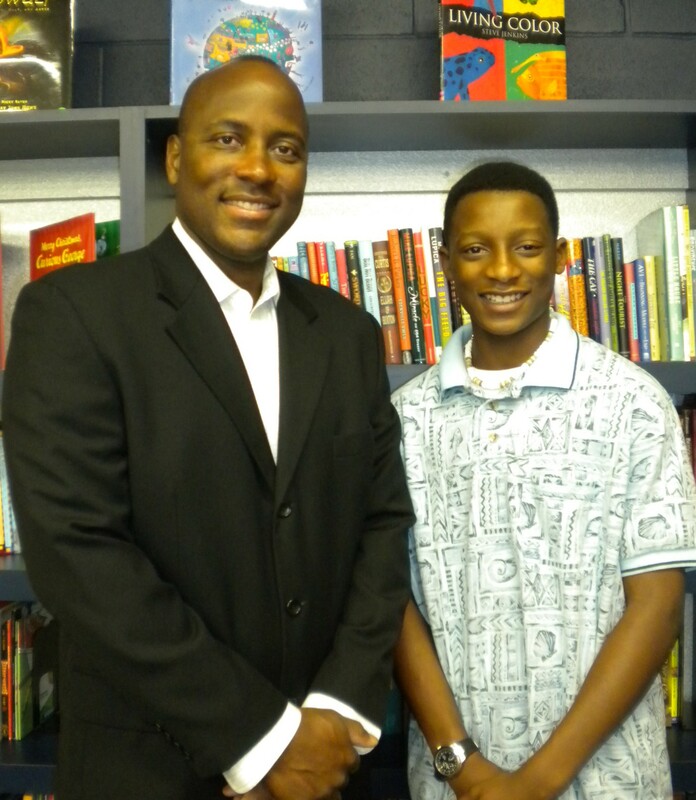 Children are tutored after school, rewarded for academic achievement, and encouraged to dream big and go far. To date, Mal Washington’s program has been remarkably successful: not a single active youth in the program has gotten pregnant or been through the juvenile justice system — for 14 years! Keeping kids engaged, encouraged and challenged on court & off. 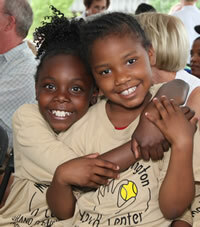 In May 2008, the Mal Washington Kids Foundation opened its own 9,000 square-foot center with 8 lighted courts, computer labs, classrooms, fitness center, locker rooms, and library. And every September since 1997, at a gala event, Mal Washington has presented the George M. Soper Student Athlete Trophy & Scholarship to one child, aged 10 to 15, who has excelled on the court, in the classroom, and in the community … along with a total of $450,000 in scholarships awarded to other deserving kids who have overcome great odds to stand on that stage. My $100 today goes to the Mal Washington Kids Foundation in honor of both Mal and George – and their belief that tennis is all about the way you serve. 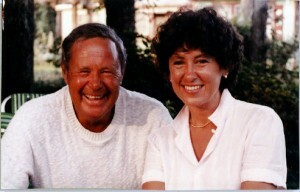 To join me and the Soper family who support George’s scholarship, click here.